On Sunday 23rd October the U9s played against Ballyboden and Clanna Gael in a blitz. The girls formed two teams, each playing 3 matches and were tenacious against solid opposition. It was great to see accurate hand passing and the growing confidence of the girls in taking their chances on goal. We were very proud of the girls who volunteered to play on the opposing teams when they were short players. Despite the cold, windy conditions the girls had a great time and proudly displayed their new medals. Congratulations to Ballyboden for hosting such a great afternoon. On Saturday 8th October 22 girls (and parents too!) had great fun participating in the DLR Core Credit Fun run. We met at Kilbogget in our bright DLR t-shirts and the girls earned their gold medals completing the 5km with 1200 other runners. We all had a great time and saw what fun exercise could be. Our U9 team are having a fantastic season so far. 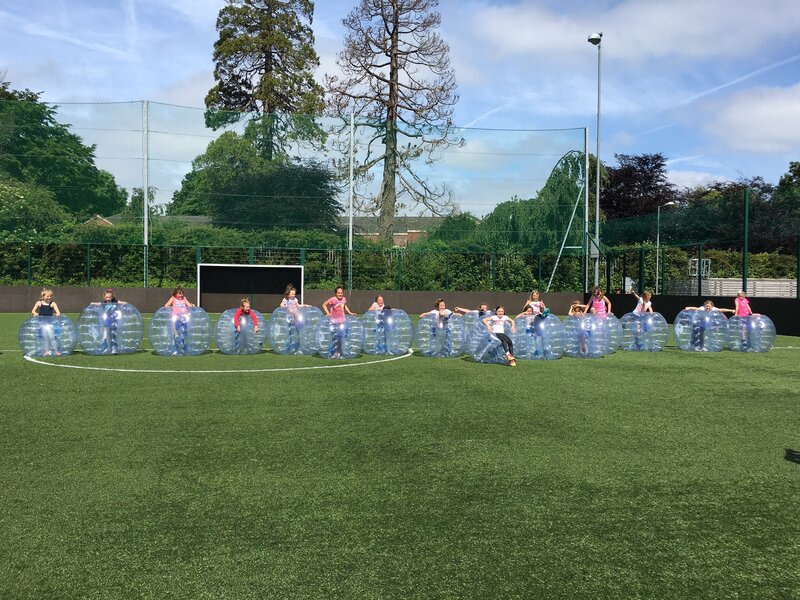 They'll be taking a break for the summer in the next few weeks, but to finish off the "first half" of the season, they were treated to a "Bubble Football" party on Saturday. By all accounts, a great time was had by all. Well done the U9 management team for organising the day. The Under 9s had their first match Sunday 27th February, with a friendly against Naomh Olaf at Kilbogget. Three teams represented Foxcab with enthusiasm and energy. The girls worked really well in different positions and were great at passing and moving with the ball. The coaches were particularly impressed with how each player returned to their position when 'shape' was called. Well done girls on a great start to the season. Under 8 girls were participating in their first ever Go Games matches for the club away to Cuala. This was a big day for all girls taking part. Fox Cab fielded two teams and all the girls played with great commitment and there was some great skill displayed from the whole squad. The Fox Cab ended the morning ahead in all of the matches with some great scores and determination shown. It was a wonderful team performance overall and well done to all involved and to the parents for their support. The under 8âs train every Saturday morning at 9:45 in the Academy.